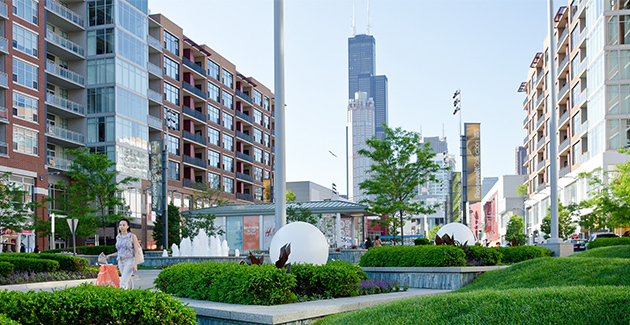 Chicago apartments that offer proximity to good restaurants or fine shops are always in demand. But for the ultimate convenience factor, nothing really comes close to hopping in the elevator and riding it down to find a grocery store, coffee shop or great restaurant right in the apartment building lobby. In the age of on-demand grocery delivery and Amazon, it seems like apartment renters could feasibly get everything brought to their door. But let’s face it: Sometimes there’s a last-minute grocery run that can’t be ordered up via the smartphone; or maybe renters just get tired of being cooped up in their apartments. Having a reliable dining or entertainment outlet right in the building makes the long Chicago winter much more livable. 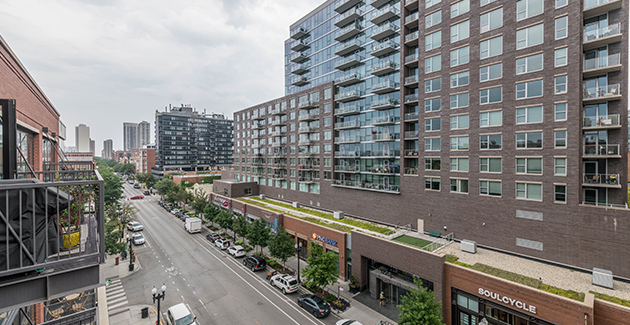 Here are five Chicago apartment buildings that give renters an extra dose of the convenience factor by incorporating sensible ground floor retail into the building. The fully customizable walk-in closets in each apartment for rent at The Sinclair help renters stay organized. To further streamline life for renters at Old Town’s newest apartment community, the ground floor supermarket makes it incredibly easy to pick up all of the groceries without disrupting the weekly routine. The only downside? Renters may feel a little pang of guilt if they order takeout from one of Old Town’s stellar restaurants when all the fixings for a fine home-cooked meal are right downstairs! 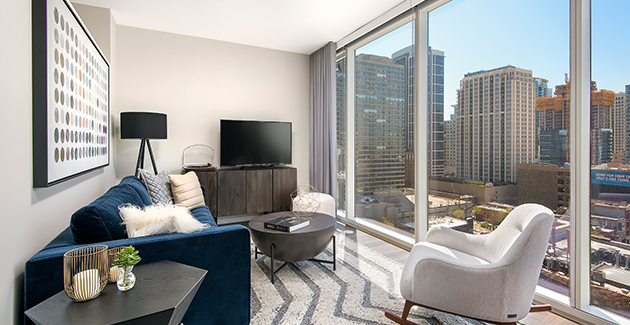 These modern loft apartments in the South Loop neighborhood offer renters two things that are the pinnacle of urban apartment living: convenience and style. These flexible 1- and 2-bedroom South Loop lofts can easily plug into the social fabric of renters’ everyday lives. The Shops at Roosevelt Collection offer fine dining and everyday shopping, while the movie theater makes it a breeze to enjoy a night out without ever having to travel beyond the courtyard. 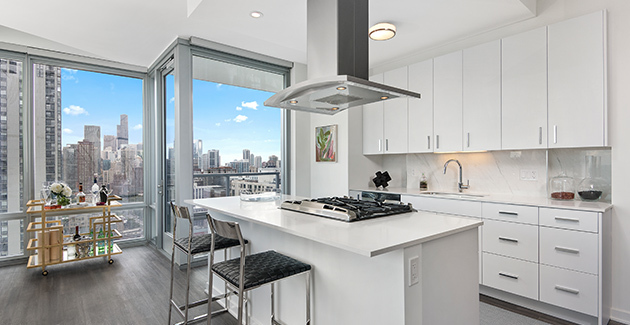 These sharp new apartments in the South Loop are brimming with high end appliances and luxe finishes. But sometimes it’s good to cut loose and relax in a spontaneous bout of karaoke. Despite the popular assumption that karaoke only happens at bars with a bunch of rowdy strangers whooping and cheering in the background (although that’s a fine way to do it), karaoke can be both an intimate and upscale experience if you know where to look. And apartment renters at Eleven40 South Loop don’t have to trek far to find one of the neighborhood’s great hidden gems: a karaoke lounge that does things in the Korean style, which means private rooms for group parties that offer food and drink service to the rooms. Walking out of the Eleven40 lobby and heading one door to the north on Wabash Street will land renters at an out-of-this-world party experience that will impress virtuoso singers and karaoke newbies alike. OK, a Starbucks isn’t exactly breaking the mold when it comes to coffee shops in Chicago. But those mornings when you really could use an extra caffeine boost to start the day, it doesn’t hurt to have a viable option as soon as you step out of the lobby elevator. Plus, it could make for a pleasant change of scenery should you ever decide to step out of the office and work from home, but not really from home, instead opting for the energized and buzzing interior of this Wells Street coffee shop that conveniently shares the ground floor with your Old Town apartment building. These Lincoln Park apartments offer renters much more than sweeping views of the city’s largest public park and Lake Michigan. Apartment renters who like to entertain at their pad right across the street from Lincoln Park Zoo will appreciate the Park View Grocer on the ground floor of this vintage building. Why? Picture the scene: friends gathered around the living room, everyone chatting about the TV shows that they’re really into lately, and -- wouldn’t you know it! -- the wine has run out. 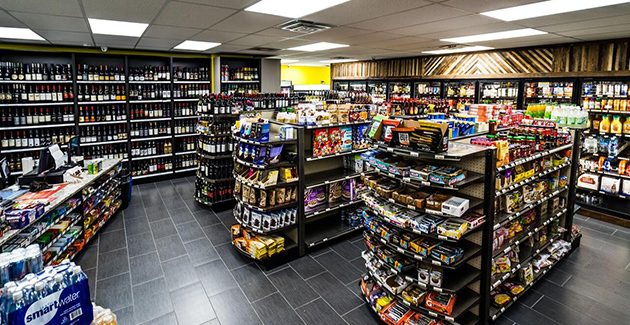 Luckily, a fully stocked grocery store right in the building’s lobby means you can quickly restock the libations, snacks, or anything else that may be missing, and do it at a moment’s notice. This is particularly nice when the thermometer is showing single digits.